This weekend the Alternative Press Expo came to town. It’s a nice little convention that brings together the independent publishing community, put on by the same folks who bring you ComicCon. Most of the tables were taken up by comic artists and writers, but a fair number of zine publishers, crafters, illustrators and small shops also represented. Soon after arriving, I swung by the Neon Monster table, where I got to meet the lovely and talented Marian Churchland. Among other things she has drawn for Richard Starkings’ Elephantmen series. I had met Starkings and Justin “Moritat” Norman (the main Elephantmen artist) the day before at Neon Monster’s Second anniversary party. Happy Birthday, Mitch! Mr. Starkings gave me a few autographed issues of Elephantmen to peruse and I have to say, it’s not a bad rag. Mr. Moritat also drew me a sketch of Jean Grey as Phoenix, perhaps my favorite comic book character ever. Thank you guys! 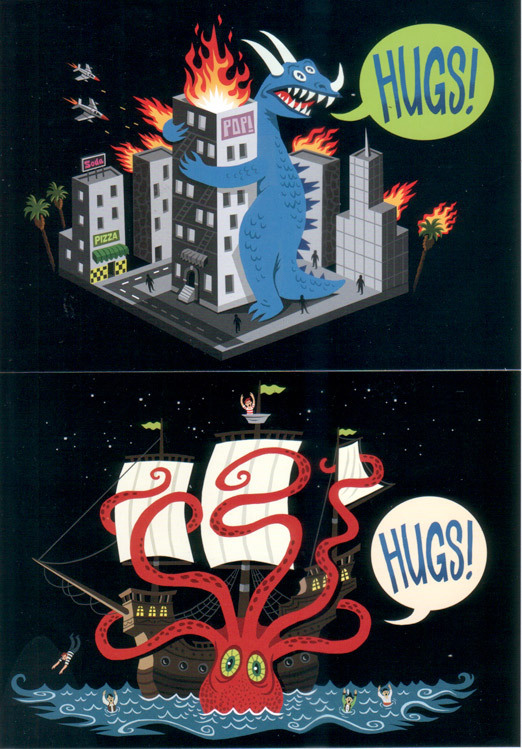 The best thing I got, though, was this set of monster hugs cards from Goblin-Fish Press. There were five in the pack but these two are my favorites. Hilarious! If you’re sad you missed A.P.E., don’t worry. There are two similarly awesome events happening next month. For you east coasters, visit the Editions & Artists Books Fair in NYC beginning Nov. 5th. While you’re there, say hi to the good folks at The Present Group. For you west coasters, come hang out with me at DesignerCon in Pasadena on Nov. 21st!